Ladies Getaway Tennis & Wine Weekend, TX. Horseshoe Bay Resort. The getaway begins with social tennis and drinks Friday afternoon, continues on Saturday with three hours of morning tennis drills followed by lunch and a winer tour, and concludes Sunday morning with two more hours of drills cappped off by mimosas and awards. For more information, visit Ladies Getaway Tennis & Wine Weekend or phone: 512-924-7097 or email: . 118th Ojai Valley Tennis Tournament, CA. Ojai Valley Inn & Spa. An Open, collegiate, and junior event centered in Ojai but whose early rounds are played at venues and private courts all over the county. As details for this year become available, we'll post them here. For more information and to purchase tickets online, go to www.ojaitourney.org. For more information, visit 118th Ojai Valley Tennis Tournament or phone: 805-646-7241. Ladies Retreat by Cliff Drysdale Tennis, CA. Omni La Costa Resort & Spa. Director of tennis Bryce Cunningham and the Cliff Drysdale Tennis staff stage this ladies-only retreat at the Omni La Costa Resort & Spa in Carlsbad, north of San Diego, CA. The 5-day event bundles drills and match play with lodging and meals. For more information, visit Ladies Retreat by Cliff Drysdale Tennis or phone: 830-625-5911, ext 208 or email: . Antigua Tennis Week, Antigua, West Indies. Curtain Bluff Resort. International Tennis Hall of Famer Fred Stolle, the winner of 18 Grand Slam titles, leads this animated week of clinics, exhibitions, pro-ams, team competitions, cocktails, and dinners with help from Owen Davidson, himself a multiple Grand Slam winner, and Aussie champion Ross Case. For more information, visit Antigua Tennis Week or phone: 888-289-9898. A combined men's and women's clay-court event. Alexander Zverev and Petra Kvitova are defending champions. For more information, visit Mutua Madrid Open. Boomer Tennis (Senior Tennis), SC. Van Der Meer Tennis, Shipyard. This 16-hour weekend program bundles strokes mechanics, drills, supervised match play, and a Boomer fitness component, all designed for players 50 and older with NTRP ratings from 2.0-4.5. For more information, visit Boomer Tennis (Senior Tennis) or phone: 800-645-6138 or email: . Stan Smith Super Series, SC. The Sea Pines Resort. Wimbledon and U.S. Open Champion and former World No. 1 Stan Smith conducts a fun-filled weekend clinic at the Sea Pines Racquet Club. Over the course of nine hours (3 hours each day), Smith and his staff will focus on stroke and strategy instruction, footwork, and many practice drills as well as videotape your serve. Student:pro ratio never more than 4:1, ensuring personal attention. Open to players 17+ years old with an NTRP rating of 3.0+. For more information, visit Stan Smith Super Series. Boomer Tennis (Senior Tennis), SC. Van Der Meer Tennis, Shipyard. This 8-hour weekend program bundles strokes mechanics, drills, supervised match play, and a Boomer fitness component, all designed for players 50 and older with NTRP ratings from 2.0-4.5. For more information, visit Boomer Tennis (Senior Tennis) or phone: 800-645-6138 or email: . The Italian Open, a combined men's and women's event, held in Rome's Foro Italico. Rafa Nadal and Elena Svitolina are defending champions. For more information, visit Internazionali BNL d'Italia. Rafa Nadal handily won his 11th French Open while the women's final crowned Simona Halep. For more information, visit ROLAND GARROS (French Open). PBI World Tennis Camp, Tirol, Austria. Bio-Hotel Stanglwirt. With 8 red-clay courts laid out on the apron of the Wilder Kaiser mountains in Austria's Tirol, the Bio-Hotel Stanglwirt makes for an uncommonly picturesque setting for this PBI World Tennis Camp. Participants receive more than 20 hours of instruction and programming over five days, equally divided between group clinics and supervised tournaments and other on-court activities. The package includes a welcome reception and closing ceremony, camp awards, gifts, pictures and much more. For more information, visit PBI World Tennis Camp. Angelique Kerber and Novak Djokovic are defending champions. For more information, visit WIMBLEDON. Doubles Boot Camp, VT. Stratton Mountain Resort. The weekend kicks off Friday evening with two hours of skills and drills clinics and mixer, picks up again on Saturday with another five hours of instruction and match play followed by dinner with the pros, and concludes Sunday morning For more information, visit Doubles Boot Camp or phone: 802-297-4236. Campbell's Hall of Fame Tennis Championships, RI. International Tennis Hall of Fame. America's last grass-court event on the fabled lawns of Newport Casino. Before play on Saturday, they will hold the induction ceremony for the newest members of the International Tennis Hall of Fame. 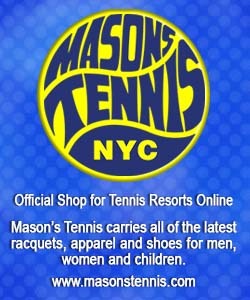 For more information, visit Campbell's Hall of Fame Tennis Championships or phone: 866-914-FAME. Stratton Open, VT. Stratton Mountain Resort. One of the new range of tennis tournaments run by the Cliff Drysdale Tennis team at the Stratton, the Stratton Open is a singles tournament with big prizes on the line. Different flights will be created depending on the level of play involved. Invitations will be sent out to local pros to come and play so if you think you can hack it with some of Vermont's finest, sign up and play in one of our divisions. For more information, visit Stratton Open or phone: 830-625-5911, ext 208 or email: . PBI World Tennis Camp, CA. Silverado Resort and Spa. This special camp pairs tennis instruction with wine education and tastings in the Napa Valley. It bundles 20 hours of tennis instruction and programs with a welcome dinner, round robin, pro-am tournament, and sommelier-led wine tasting. Discounted room rates available. For more information, visit PBI World Tennis Camp or email: . Pro-Am Tennis Weekend, VT. Stratton Mountain Resort. This team tennis-style competition gives you a chance to play with and against the Drysdale pro team. Look out for special guest pros announcement closer to the date. Competition aside, the envet concludes with a celebratory dinner and drinks. For more information, visit Pro-Am Tennis Weekend or phone: 802-297-4236. ATP World Tour Masters event, held this year in at Montreal's IGA Stadium. Rafa Nadal is defending champion. For more information, visit Rogers Cup (Men) or phone: 877-283-6647. A WTA singles and doubles event held on the hard courts at the Aviva Centre at York University in Toronto this year. Simona Halep is defending champion. For more information, visit Rogers Cup (Women) or phone: 514-273-1234. Novak Djokovic and Naomi Osake are defending champions. For more information, visit U.S. OPEN. Stan Smith Super Series, SC. Sea Pines Racquet Club. Wimbledon and U.S. Open Champion and former World No. 1 Stan Smith conducts a fun-filled weekend clinic at the Sea Pines Racquet Club. Over the course of nine hours (3 hours each day), Smith and his staff will focus on stroke and strategy instruction, footwork, and many practice drills as well as videotape your serve. Student:pro ratio never more than 4:1, ensuring personal attention. Open to players 17+ years old and NTRP 3.0+ rating. Cost: $305/person For more information, visit Stan Smith Super Series or phone: 843-363-4995. PBI World Tennis Camp, GA. Reynolds Lake Oconee and Ritz-Carlton Reynolds. This camp bundles 20+ hours of tennis clinics and programming with a welcome reception and dinner, awards ceremony, boat ride, camp pictures, gifts, and a pro exhibition. For more information, visit PBI World Tennis Camp. Ladies Retreat by Cliff Drysdale Tennis, FL. Omni Amelia Island Plantation Resort. Join director of tennis Sal Barbaro and his professional staff for this 5-day/4-night, ladies-only tennis retreat. The package bundles oceanview accommodations with 15 hours of instruction and drills, coached team competition and match play, daily breakfast, an awards banquet and players' party, dinner in Fernandina Beach, and optional spa services. For more information, visit Ladies Retreat by Cliff Drysdale Tennis or phone: 800-733-7987. Cliff Drysdale Ladies Tennis Retreat, FL. Ritz-Carlton, Key Biscayne. Join Retreat director Scott Colebourne and his professional staff for this 5-day/4-night, ladies-only tennis retreat. The package bundles hotel accommodations with 15 hours of instruction and drills, coached team competition and match play, daily breakfast, a welcome reception, a players' party (with an awards presentation and video show), and optional spa services. For more information, visit Cliff Drysdale Ladies Tennis Retreat or phone: 830-625-5911, ext 208 or email: . Stan Smith Super Series, SC. Sea Pines Racquet Club. This annual event, held over Thanksgiving weekend, bundles three mornings of clinics (three hours each) personally conducted by former world No. 1 Stan Smith with a Friday afternoon doubles exhibition. Open to players 17+ years old and NTRP 3.0+ rating. The cost weekend is $305/person. For more information, visit Stan Smith Super Series or phone: 843-363-4495. PBI World Tennis Camp, Bahamas. Baha Mar. More than 18 hours of instruction and competition, including a "Grand Slam" round robin on the resort's hard, clay, and grass courts, as well as a farewell party, are built into this 5-day/4-night package. Multiple lodging options are available. For more information, visit PBI World Tennis Camp.